This article is about a multiple of bytes. For other uses, see Gigabyte (disambiguation). For the binary unit of measurement, see gibibyte. The gigabyte (/ˈɡɪɡəbaɪt, ˈdʒɪɡə-/) is a multiple of the unit byte for digital information. The prefix giga means 109 in the International System of Units (SI). Therefore, one gigabyte is 1000000000bytes. The unit symbol for the gigabyte is GB. This definition is used in all contexts of science, engineering, business, and many areas of computing, including hard drive, solid state drive, and tape capacities, as well as data transmission speeds. However, the term is also used in some fields of computer science and information technology to denote 1073741824 (10243 or 230) bytes, particularly for sizes of RAM. The use of gigabyte may thus be ambiguous. Hard disk capacities as described and marketed by drive manufacturers using the standard metric definition of the gigabyte, but when a 500-GB drive's capacity is displayed by, for example, Microsoft Windows, it is reported as 465 GB, using a binary interpretation. To address this ambiguity, the International System of Quantities standardizes the binary prefixes which denote a series of integer powers of 1024. With these prefixes, a memory module that is labeled as having the size 1GB has one gibibyte (1GiB) of storage capacity. This 2.5 inch hard drive can hold 500 GB (i.e., 500 billion bytes) of data. The term gigabyte is commonly used to mean either 10003 bytes or 10243 bytes. The latter binary usage originated as compromise technical jargon for byte multiples that needed to be expressed in a power of 2, but lacked a convenient name. As 1024 (210) is approximately 1000 (103), roughly corresponding to SI multiples, it was used for binary multiples as well. Based on powers of 10, this definition uses the prefix giga- as defined in the International System of Units (SI). This is the recommended definition by the International Electrotechnical Commission (IEC). This definition is used in networking contexts and most storage media, particularly hard drives, flash-based storage, and DVDs, and is also consistent with the other uses of the SI prefix in computing, such as CPU clock speeds or measures of performance. The file manager of Mac OS X version 10.6 and later versions are a notable example of this usage in software, which report files sizes in decimal units. 1 GiB = 1073741824 bytes (= 10243 B = 230 B). The binary definition uses powers of the base 2, as does the architectural principle of binary computers. This usage is widely promulgated by some operating systems, such as Microsoft Windows in reference to computer memory (e.g., RAM). This definition is synonymous with the unambiguous unit gibibyte. Since the first disk drive, the IBM 350, disk drive manufacturers expressed hard drive capacities using decimal prefixes. 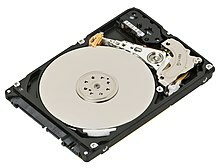 With the advent of gigabyte-range drive capacities, manufacturers based most consumer hard drive capacities in certain size classes expressed in decimal gigabytes, such as "500 GB". The exact capacity of a given drive model is usually slightly larger than the class designation. Practically all manufacturers of hard disk drives and flash-memory disk devices continue to define one gigabyte as 1000000000bytes, which is displayed on the packaging. Some operating systems such as OS X express hard drive capacity or file size using decimal multipliers, while others such as Microsoft Windows report size using binary multipliers. This discrepancy causes confusion, as a disk with an advertised capacity of, for example, 400 GB (meaning 400000000000bytes) might be reported by the operating system as 372 GB, meaning 372 GiB. The JEDEC memory standards use IEEE 100 nomenclature which quote the gigabyte as 1073741824bytes (230 bytes). The difference between units based on decimal and binary prefixes increases as a semi-logarithmic (linear-log) function—for example, the decimal kilobyte value is nearly 98% of the kibibyte, a megabyte is under 96% of a mebibyte, and a gigabyte is just over 93% of a gibibyte value. This means that a 300 GB (279 GiB) hard disk might be indicated variously as 300 GB, 279 GB or 279 GiB, depending on the operating system. As storage sizes increase and larger units are used, these differences become even more pronounced. Some legal challenges have been waged over this confusion such as a lawsuit against drive manufacturer Western Digital. Western Digital settled the challenge and added explicit disclaimers to products that the usable capacity may differ from the advertised capacity. Seagate was sued on similar grounds and also settled. Because of its physical design, the capacity of modern computer random access memory devices, such as DIMM modules, is always a multiple of a power of 1024. It is thus convenient to use prefixes denoting powers of 1024, known as binary prefixes, in describing them. For example, a memory capacity of 1073741824bytes is conveniently expressed as 1 GiB rather than as 1.074 GB. The former specification is, however, often quoted as "1 GB" when applied to random access memory. Software allocates memory in varying degrees of granularity as needed to fulfill data structure requirements and binary multiples are usually not required. Other computer capacities and rates, like storage hardware size, data transfer rates, clock speeds, operations per second, etc., do not depend on an inherent base, and are usually presented in decimal units. For example, the manufacturer of a "300 GB" hard drive is claiming a capacity of 300000000000bytes, not 300x10243 (which would be 322122547200) bytes. One hour of SDTV video at 2.2 Mbit/s is approximately 1 GB. Seven minutes of HDTV video at 19.39 Mbit/s is approximately 1 GB. 114 minutes of uncompressed CD-quality audio at 1.4 Mbit/s is approximately 1 GB. A single layer DVD+R disc can hold about 4.7 GB. A dual-layered DVD+R disc can hold about 8.5 GB. A single layer Blu-ray disc can hold about 25 GB. ^ a b SanDisk USB Flash Drive "Note: 1 megabyte (MB) = 1 million bytes; 1 gigabyte (GB) = 1 billion bytes." ^ a b Storage Chart "Megabyte (MB) = 1,000,000 bytes; 1 Gigabyte (GB) = 1,000,000,000 bytes; 1TB = 1,000,000,000,000 bytes"
^ "How OS X and iOS report storage capacity - Apple Support". support.apple.com. Retrieved 2016-06-29. ^ JEDEC Solid State Technology Association (December 2002). "Terms, Definitions, and Letter Symbols for Microcomputers, Microprocessors, and Memory Integrated Circuits" (PDF). Jesd 100B.01. ^ a b c Mook, Nate (2006-06-28). "Western Digital Settles Capacity Suit". betanews. Retrieved 2009-03-30. ^ Baskin, Scott D. (2006-02-01). "Defendant Western Digital Corporation's Brief in Support of Plaintiff's Motion for Preliminary Approval". Orin Safier v. Western Digital Corporation. Western Digital Corporation. Retrieved 2009-03-30. ^ Judge, Peter (2007-10-26). "Seagate pays out over gigabyte definition". ZDNet. Retrieved 2014-09-16. ^ Percival, Colin. "Why is 1 GB equal to 10^9 bytes instead of 2^30?". tarsnap.com. Retrieved 1 November 2015.